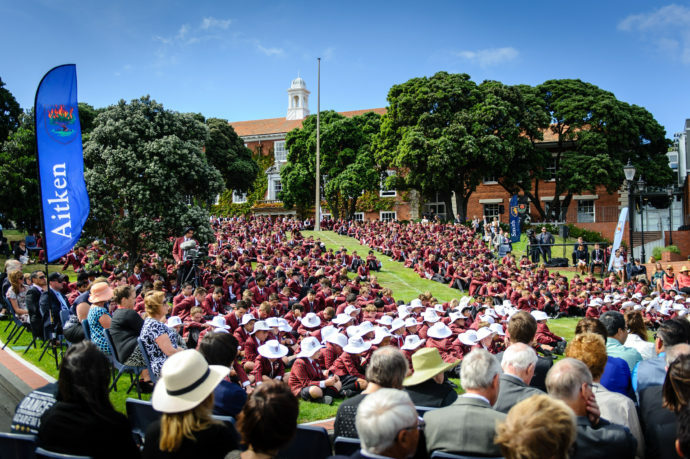 The Scots College centenary year in 2016 was truly a year to remember with key events in February and culminating in the official Centenary Weekend in August. It was an opportunity to not only reflect on what the College has become but also to acknowledge the sacrifices of our forefathers and the ongoing support of our Scots College family who have enabled the College to thrive over the last century. Thank you to the many Old Boys, past staff and members of the wider Scots family who reconnected with the College and one another. 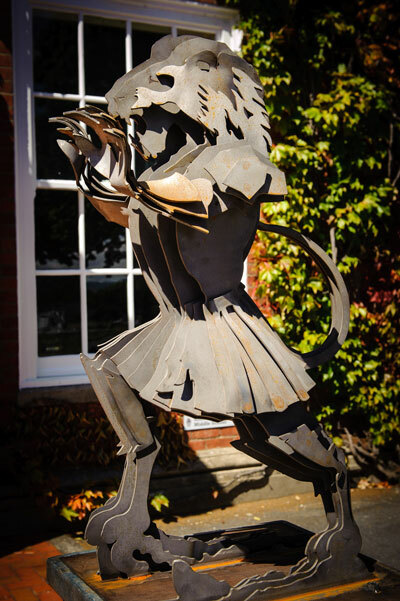 To start the year the Strathmore Lions, a pair of iconic sculptures designed and manufactured by Weta Workshops and donated by Scots parents Sir Richard and Lady Tania Taylor, were installed as centenary sentinels outside the Aitken building. On the first day of the school year a whole College chapel service commenced our celebrations. Students, staff and members of the community welcomed the year ahead, raised the Centenary flag, cut the Centenary cake and launched the SCOBA Heritage Walk and Timeline. 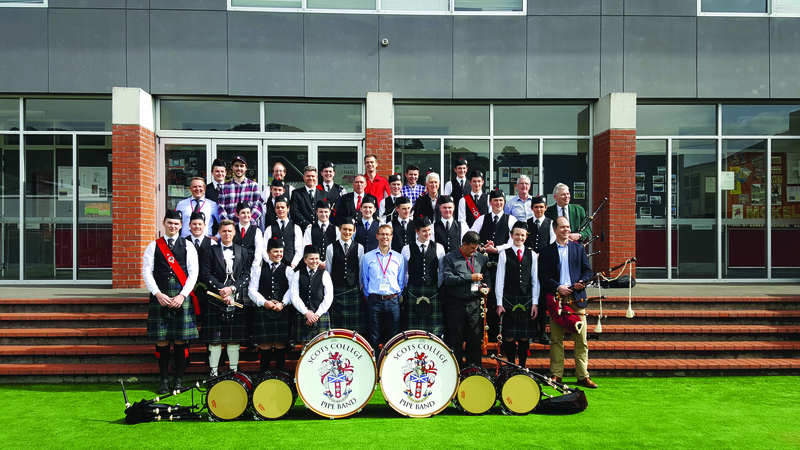 On the Friday the Pipe Band led students, family, Old Boys and friends on a parade through Wellington city from Queen Margaret College, the original site of Scots College in 1916, to Parliament where they were greeted by guest speaker Hon. Chris Finlayson. Concluding the February key events on the official Founder’s Day of 8 February was a community picnic. Blessed with beautiful weather the front field was abuzz with Old Boys taking on current students in cricket and tennis, egg and spoon races, food stalls, a beer garden and vintage inspired fancy dress. Lynne Sandri, our 2017 Artist in Residence, who was commissioned to produce a centenary painting for the College, cleverly captured the essence of the last one hundred years of Scots College history in a stunning oil painting. This now takes pride of place in the foyer to the Headmaster’s office. Limited edition prints and gift cards are available here. The official Centenary Weekend in August welcomed over 600 visitors to the College. 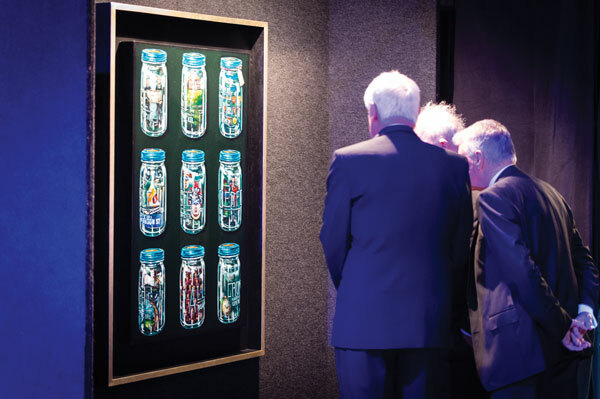 A Centenary cross was unveiled on the Friday and the weekend was kicked off with a packed Old Boys and Boutique Beers event. Saturday saw a past staff morning tea, generations of Great Scots luncheon, Old Boys vs. current students football and hockey matches, a variety show and art exhibition followed by the event of the century, a black tie gala in the totally transformed gymnasium. Visitors returned on the Sunday for a Rugby brunch and 1st XV match while the ladies met over bubbles at the Ladies Long Lunch. In addition an impressive Archives display was on show in ‘The Hub’ which was a highlight for many visitors. Outside the main activities centenary old boy reunions were held in Sydney and Melbourne with the highlight being the London event at the House of Commons thanks to Old Boy John Samiotis and his wife Jane Ellison, MP for Battersea. Current students also took up the centenary challenge with a wide range of activities which included a coin trail, photo competition, costume day and the oral histories project. A key focus of the year was giving back to the community and it was out of this that $20,000 was raised for the Wellington Free Ambulance. Our thanks to all those who contributed to this worthy cause. Scots100 ‘Great Memories’ Centenary Video Project from Scots College on Vimeo.